Is is too much of a pun to say ‘As you like it…but I think you will?’ …ok then I won’t. But you get the idea. 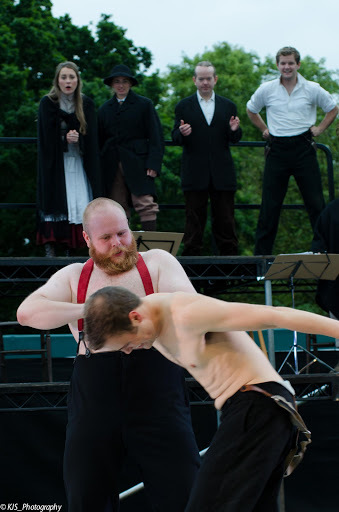 As You like it takes place predominantly in the forest of Arden, so it was the perfect setting with the backdrop of trees in Bute Park. Complete with occasional animal noises (well seagulls and dogs…) but as the light darkens the green lit stage and the backdrop of trees creates the perfect atmosphere for the play. One of the most popular Shakespeare comedies, it’s easy to see why. 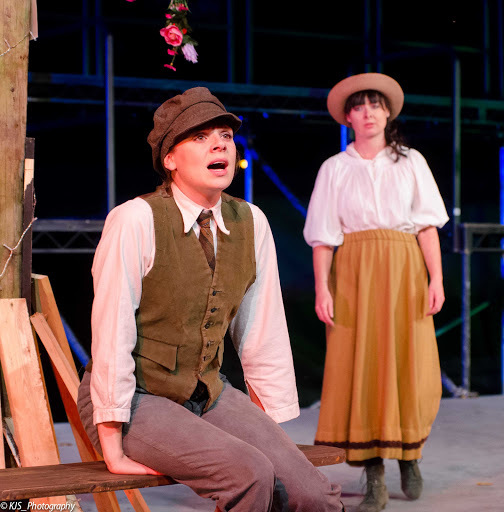 As You Like It is a heartwarming play about romance and love-in various forms, from at first sight with Rosalind and Orlando, to the harder won romance of Phoebe and her Shepherd. The play starts with a banishment, Rosalind’s mother has been banished to the forest, while she remains with her aunt and cousin Celia. After seeing young man Orlando wrestling his way to victory (in a piece of excellent and hilarious staging!) it is love at first sight for Rosalind. Soon after she finds herself banished to the forest also, taking Celia with her. Orlando leaves for the forest with his elderly servant Adam soon after the ladies. What follows is a classic disguise and mistaken identities drama, which takes on the subject of love, declaring ‘Love is merely a madness’ with Rosalind disguised as a boy, teaches Orlando about wooing a woman. The backdrop of characters from forest and court provide a funny and touching story of love and life. And it’s surely not revealing too much to say that all rights itself in the end. Director Rebecca Gould weaves a wonderful production out of these elements. 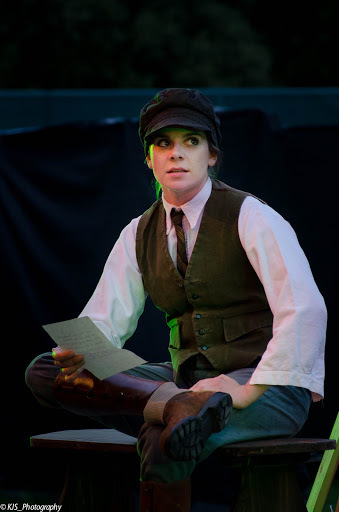 Setting the play in pre-World War One attire allows the world of the play to become distance but not too distant for the audience. The set is minimal, with two trees fashioned of branches and offcuts flanking the stage, while the performance makes use of the different levels and even the audience section to create different worlds. 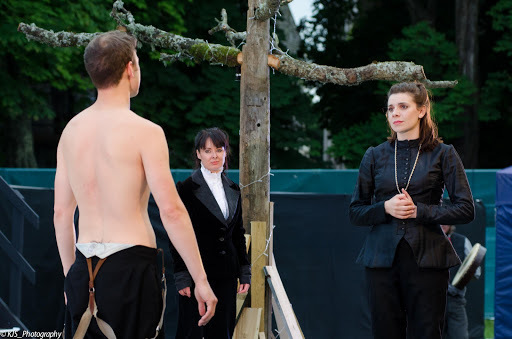 Being set within the forest, the backdrop of Bute Park creates a better set than anything than any dressing or props and this pared down approach allows the actors and Shakespeare’s words to take centre stage. The leading roles have a lot resting on them-if an audience doesn’t root for or even like Rosalind and Orlando the play falls flat. There’s no fear of this being a problem here. I must confess Rosalind is a favourite Shakespearean leading lady of mine, which always makes me anxious that actors or directors will get her wrong. Bridie Smith here allayed any fears. Her Rosalind is funny and heartwarming, but also retains the strength and intelligence of the character. Playing opposite Eifion Ap Cadno as Orlando, who brings charm and warmth to the character but also again shows the intelligence beneath Shakespeare’s Orlando. It’s easy to slip into silliness and cliche with these leading roles, but both actors bring a humour and intelligence to their versions which make them a cut above. You are immediately drawn to the individually which means you root for them-and fall a bit in love with them yourselves, which is exactly what the audience should do. They are supported by an equally talented cast who all have excellent comic timing, and really bring to life even the smaller stories within the play and make it a rich and varied production. Victoria Walters as Celia provides an excellent partner in crime for Rosalind, while Charlotte Rees as Phoebe delivers a real sense of fun with the character and not forgetting Sophie Wilmot-Jackson as Audrey completing the quartet of ladies looking for love-and stealing she show. The production is punctuated by musical interludes which really add to the production, giving the world of the play a real sense of character and allowing for some innovative transitions between scenes. Things end, as they did traditionally with a triumphant jig, which sums up wonderfully the jubilant nature of this play. For anybody looking for a first Shakespeare to see, As You Like It is always a good bet-straightforward, funny, touching it’s hard to go wrong. And it’s hard to go wrong with this production. Equally, if you’ve always meant to check out Everyman, or have just heard of them, this is a great production to start with as it shows the company at their best.